Pacifica is a 55+ community located in Oceanside, California. Located just a few miles from the beach, shopping centers and the cultural attractions of Oceanside, Pacifica, also known as Oceanside Manor, contains all of the amenities sure to please active adult homebuyers. Oceanside's inland location gives it an unmatched year-round climate, allowing the residents to enjoy outdoor activities no matter what month is on the calendar. At the center of the community is the well-appointed clubhouse. The clubhouse offers residents an exercise room for breaking a sweat. Residents can also attend community gatherings in the meeting rooms, join a game of billiards, challenge a neighbor at table tennis or cook up a meal in the catering kitchen. A library is also available for finding the next great book. Pacifica has a line-up of outdoor amenities so residents can truly enjoy the Oceanside climate. Living at this 55+ community means having access to an outdoor pool, spa and barbecue area. The community provides several ways to stay active outdoors, whether it be a game of horseshoes, tennis, or shuffleboard. For a more relaxing day, there is also a beautiful park area. Pacifica was developed between 1974 and 1980 and now hosts 223 single-family and attached homes. The single-family homes are approximately 1,100 to nearly 1,600 square feet and typically offer two or three bedrooms, two bathrooms and an attached two-car garage. The attached homes within the community offer residents just over 1,100 to approximately 1,400 square feet and have two or three bedrooms, two bathrooms and an attached garage. Some homes come with desirable features like a living room fireplace, covered patios and granite countertops. Living in Pacifica means enjoying the company of your neighbors in the midst of an unparalleled climate. This active adult community hosts holiday parties, socials, and barbecues for meeting new friends. Join a game of billiards, bridge, horseshoes or shuffleboard at the clubhouse or start a new exercise routine by joining tennis matches. Active adults in this community have more time to explore their own hobbies and interests thanks to the homeowners association (HOA). The HOA fee includes common area, exterior building and roof maintenance as well as a nightly security patrol, ensuring that residents can enjoy an active adult lifestyle in a low-maintenance environment. 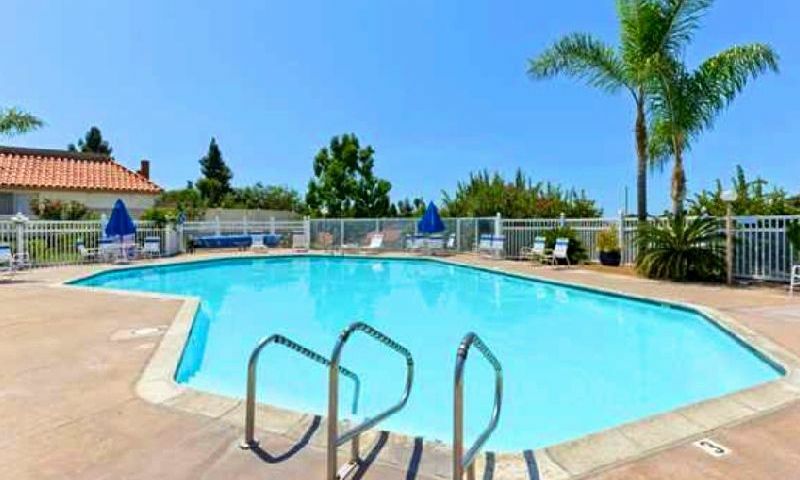 This active adult community is located in San Diego County, California. The community entrance is less than seven miles from the beach and down the street from the Pavilion Shopping Center and a Costco, making this community very convenient for everyday needs. Interstate 5 is about six miles away while the San Diego Airport is less than 50 miles away, ensuring that local or cross country travel is at your fingertips. Oceanside is home to several attractions that can keep residents busy year-round. The Pier is a great option for enjoying a nice afternoon walk while the Mission San Luis Rey will please the history fan. Oceanside also has the Oceanside Museum of Art, the Buena Vista Audubon and Nature Center, and several golf courses just a short drive away. Pacifica in Oceanside, California combines the most pleasant of climates with terrific amenities that will keep any active adult happy and busy. There are plenty of activities available in Pacifica. Here is a sample of some of the clubs, activities and classes offered here. Pacifica has townhomes that range in size from just over 1,100 to approximately 1,400 square feet and offers two or three bedrooms, two bathrooms and an attached garage. Please Note: Floor plans are not available at this time. Pacifica offers active adults single-family homes that range in size from approximately 1,100 to nearly 1,600 square feet of living space that contains two or three bedrooms, two bathrooms and a two-car garage. Please Note: Floor plans are not available at this time. 55places.com is not affiliated with the developer(s) or homeowners association of Pacifica. The information you submit is distributed to a 55places.com Partner Agent, who is a licensed real estate agent. The information regarding Pacifica has not been verified or approved by the developer or homeowners association. Please verify all information prior to purchasing. 55places.com is not responsible for any errors regarding the information displayed on this website.